It was a time to disengage from the routine, the rituals, the normal, the predictable. Being detached to get perspective and to receive that amazing sense of affirmation was an incredible gift. The delight of discovery! 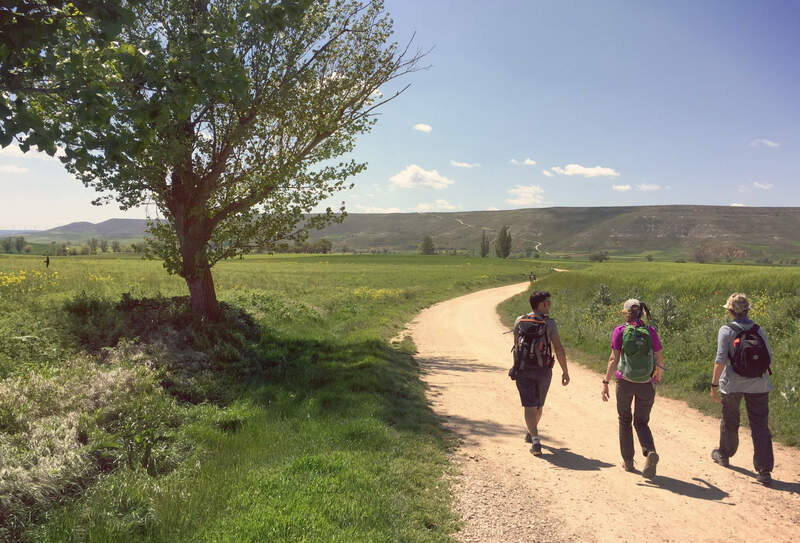 I had never heard of The Camino de Santiago until a few years ago when dear friends posted on Facebook that they were in Basque Country in the west of France, about to embark on a six week walk following this millennia-old pilgrim route. It would take them across the top of Spain, ending up at the cathedral in Santiago de Compostela in Galicia which—according to tradition—holds the bones of of Jesus’ disciple, James. Intrigued, I googled this “Way of St. James” and then discovered Emilio Estevez’s movie The Way which further peaked my interest. Next, out of the blue came another serendipitous Facebook post by a couple of friends that they were considering walking it. “Why not me?” I said to myself… The opportunity to experience Spain—a country I’d never been to—with the overlay of an ancient faith tradition, combined with a time to reflect on my life so far, was irresistible. I had to respond to the call. My walking across bits and pieces of the top of Spain on the Camino de Santiago is now behind me. But certainly it shall remain an absolute gift of an experience. Someone asked me what was the best thing about it. I had to think because the whole experience was so diverse. But then I realized that, when all was said and done, the best thing was probably the times of solitary contemplation—aided by that repetitive crunch of boots on crushed granite paths. It was a time to disengage from the routine, the rituals, the normal, the predictable. A time to listen instead of speak. A time to be quiet. And a time to let the thoughts run free. Not easy at first I must admit, as our brains seem to thrive on multitasking, anticipating, planning, reviewing, assessing, adjusting. But after a while, when the swirling clouds of thoughts finally settled down and the air cleared, the Camino offered up a quiet place. A place to listen. And then, out of the blue—twice it happened—a deep, overwhelming sense of being loved and valued and embraced and held and cared for. It hit me deeply. I cried. On the plane back home to California, they had a whole bunch of movies available. 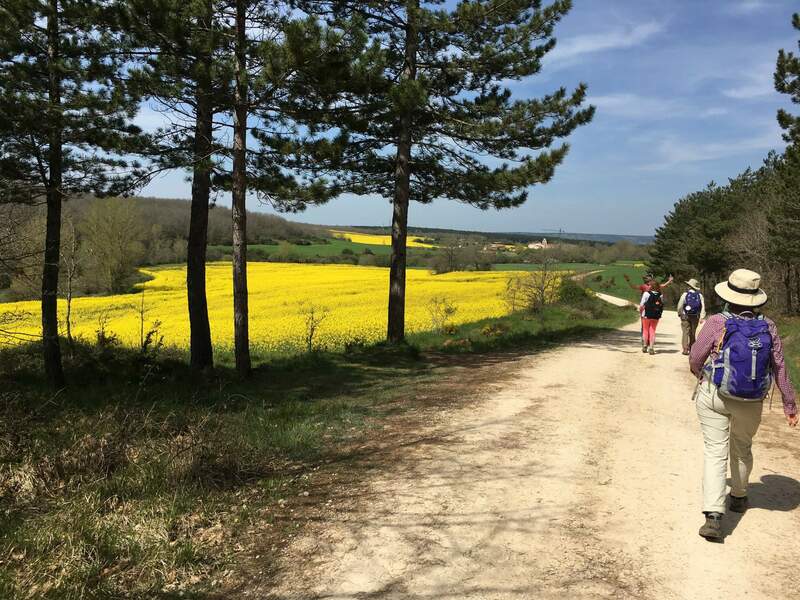 Scrolling through (wouldn’t you know it) there was one about the Camino: in German (with subtitles), it was called I’m Off Then: Losing and Finding Myself on the Camino de Santiago. Of course I had to watch it. And boom, right there on the screen, the same thing happened to the main character, Hape. Standing on the path on a Spanish hillside, there he was: bawling his eyes out… Once again, I found big hot tears rolling down my face too. Kind of embarrassing sitting so close to my fellow Lufthansa passenger! What use is my solitary journey if it doesn’t result in me being a better carrier of the Good News? So what was that all about? Honestly, an awareness of how passionately I am valued and loved by the One who created me. Theology, schmeology. I don’t really care how it is all supposed to fit neatly together, be explained, or rationalized. As someone said, “you walk your own Camino.” So I did. And that’s what happened. Looking across those extensive fields of green and gold, you could feel quite small and insignificant, yet simply putting one foot in front of the other on this millennia-old trail yielded a huge sense of worth, of meaning, of significance. It somehow strangely authenticated my faith. And that is the same faith I carry when I walk here now that I’m home. Being detached to get perspective and to receive that amazing sense of affirmation was an incredible gift. But to be authentic, it has to get outworked here in the daily grind too. It has to cause me to act and take a stand when the news is horrific (as it has been of late). It has to cause me to act when I learn of someone being marginalized or shunned because of their identity. What use is my solitary journey if it doesn’t result in me being a better carrier of the Good News—to my wife, my children, my friends and fellow travelers, those to my left and to my right as I encounter them on the journey. And so, in a very real way, the Camino continues…because an ancient path in northern Spain is actually no more significant than the one I get to walk today, right here, right now. Rod Wallace is a branding and graphics design consultant and follower of Jesus. He lives in the beautiful Wine Country of Northern California. Get essays just like this in your inbox each week. Interested?